now, don't deny ur inner love for debbie gibson. i may have a love for 80s music but i did grow up in the 90s and songs like these have a special place in my heart. =) i recently rediscovered her songs on spotify, along with bananarama and the bangles. next on my list - cathy dennis. OH YEAH, I WENT THERE. anyways, enough about music. let's get into art. can i just tell u i feel like i'm walkin on air cuz my computer is back up and runnin!! as u can tell from my blog entries, i was without it for nearly an entire month! i was foolishly trying to think it would heal itself but as the frequency of it shutting down on my unexpectedly started to increase, so did the dread in my heart. long story short, dell came and fixed it and now i am baaaaaack!! and to celebrate, i'm posting the latest of my inked commissions for a repeat client. i drew the catwoman in the bathtub for him before and he loved it so much he came back for more. so, i figured i'd do the same and add a pop of color. 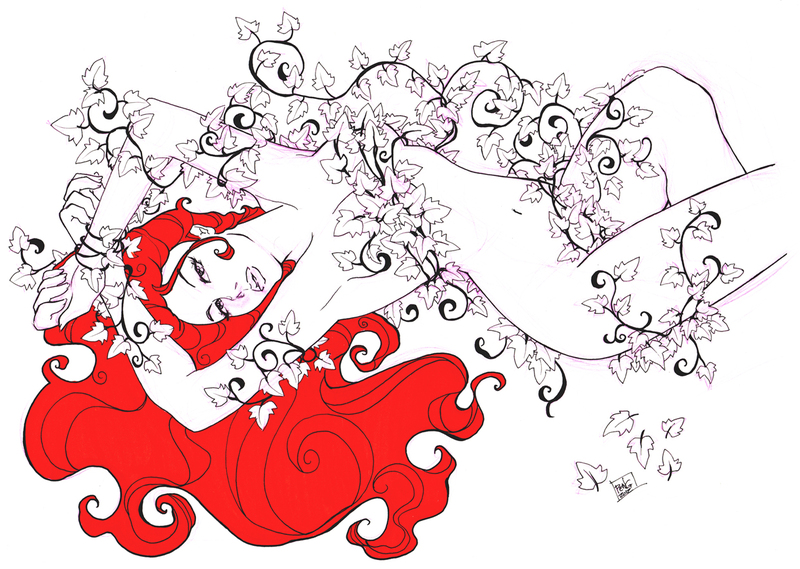 above, Poison Ivy. below, Jessica Rabbit. both pieces were drawn using photos that the client took and i turned them into these characters. i did manage to get some work done on my hubby's computer but after working on a machine with settings created specifically for me, moving to his computer was like me moving to a mac. awkward, very foreign, and went very slowly. sigh. oddly enough, that was my old computer till we got this newer one. (yeah, sorry guys, but in this house unfortunately the lady gets the new-hotness and the guy settles for the old-&-busted.) i managed to get last month's Supergirl #57 radio show cover for PendantAudio.com. 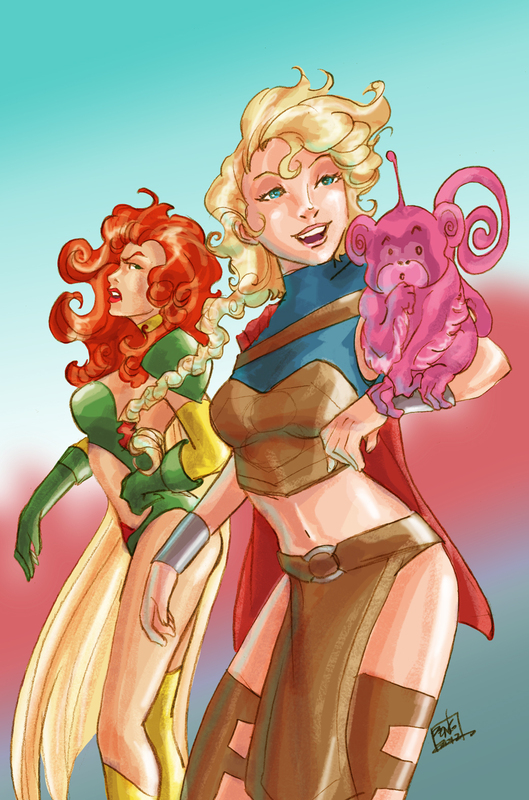 in the episode, they mentioned that Supergirl saw some type of space monkey so yep, that's what that pink thingy is. she supposedly didn't like it by i thought it'd be cuter if she did for the cover. currently, theFranchize & i are crazy busy working on multiple comic projects and they all seem to be due at the same time. =P how this happens, we have no idea. so if i'm not updating as often here or even on twitter, its cuz of that. i'm not being a jerk, i swear. last little bit of eye-candy, here's the Revenant Retribution set i recently did for 5Finity Productions (hack/slash and lady death crossover). as with most current projects, we're really not allowed to show stuff until they show stuff. so even though i'm probably not going to have a lot of shots of my art table, just know that there is always microns, copics, artwork, and a cup of coffee on there. =) of course, whenever i can, i will certainly show it. 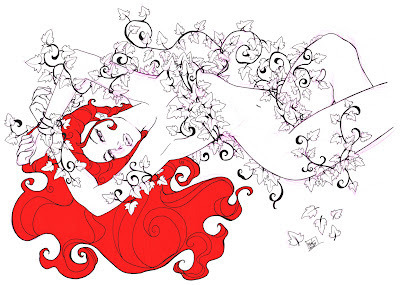 The first one of Poison Ivy is just beautiful! The hair, pose, ivy... Awesome! Glad you are back up and running!